Found 89 blog entries for April 2015. On May 1 and 2, come to Chief Joseph Middle School, 504 Wilson St. in Richland, Washington for an exciting presentation. 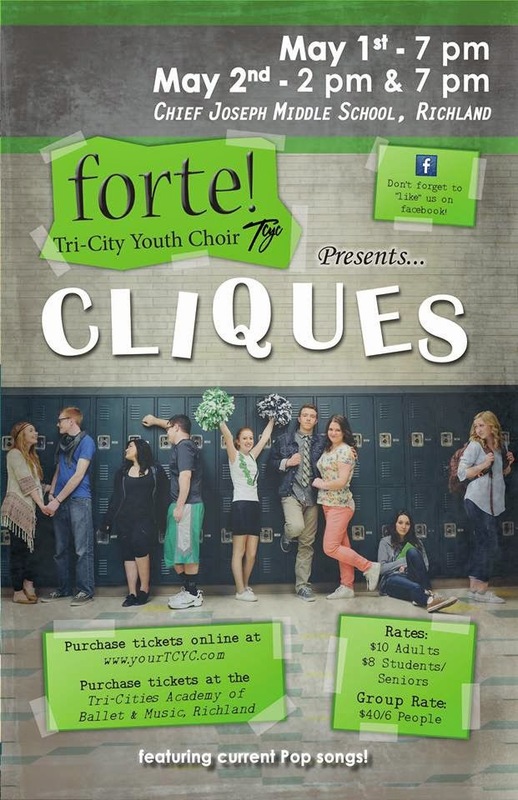 Forte Youth Choir presents "Cliques" - a fantastic choral Pop concert with dazzling choreography about an imaginary day-in-the-life-of HIGH SCHOOL. Friendship, romance, stress, schoolwork, status, fitting in, feeling lost, and reaching out. Heart-warming. Sometimes humorous. This year Camerata Musica's Young Artists of Distinction concert will be on Sunday, May 3. The show starts at 2:00 in the evening at the Battelle Auditorium on the campus of Pacific Northwest National Laboratory in Richland, Washington. The event showcases talented young Tri-City musicians for decades. It will feature Tri-City area musicians in high school or younger who’ve distinguished themselves at competitions and other music events during the past year. This coming Saturday, May 2 come watch Seattle trio Uncle Bonsai at the Community Unitarian Universalist Church located at 2819 W. Sylvester Street in Pasco, Washington. Show starts at 7:30 in the evening. 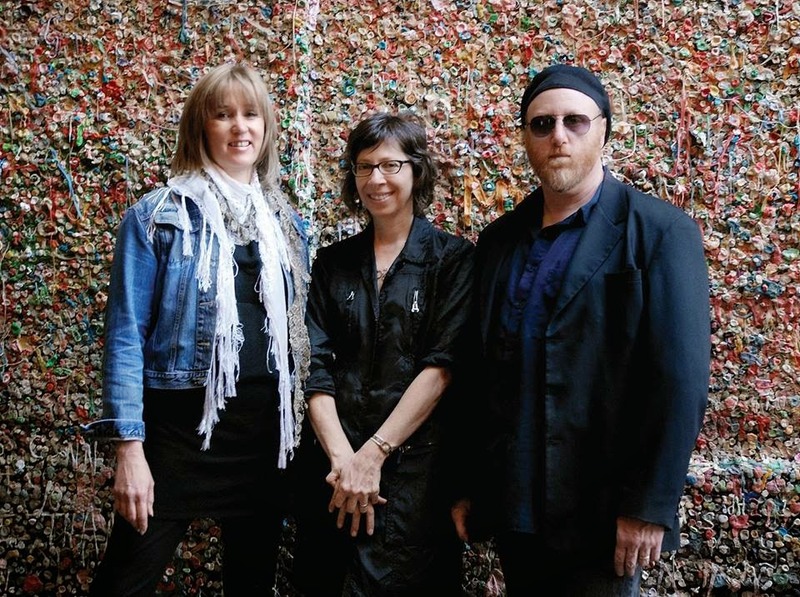 The Seattle trio Uncle Bonsai will once again perform original, contemporary folk/pop music. With their soaring and intricate 3-part vocal harmonies and biting humor, accompanied by only an acoustic guitar, Arni Adler, Patrice O'Neill, and Andrew Ratshin deliver poignantly unflinching portrayals of life, love, and a guy named Doug. The trio's influences range from the Beatles to Stephen Sondheim. Tickets in advance are $11 general admission and $9 for seniors and students. 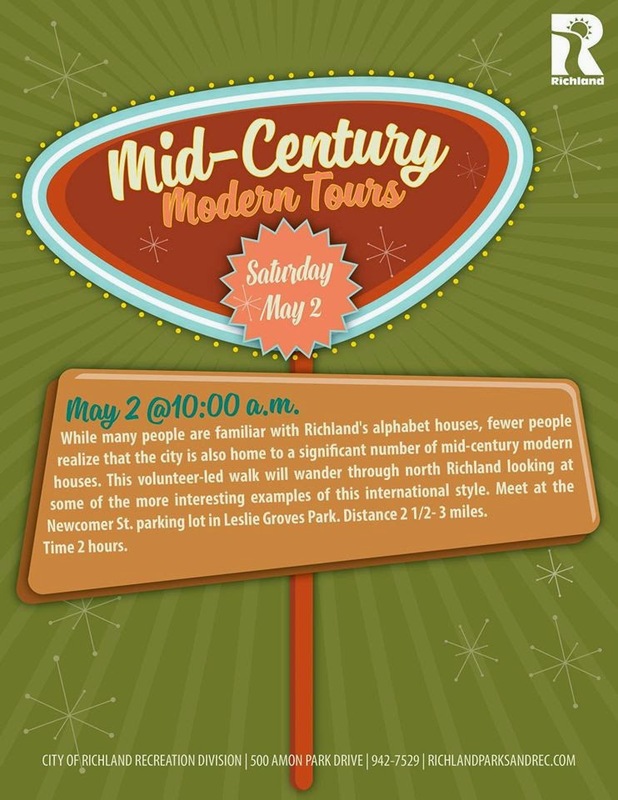 On Saturday, May 2 come to the Mid-Century Modern House Tour starting at Leslie Groves Park at Newcomer Street Entrance located at the East end of Newcomer Street Richland , Washington. Tour will be from 10:00 in the morning until 12:00 noon. Admission is free. While many people are familiar with Richland's alphabet houses, fewer people realize that the city is also home to a significant number of mid-century modern houses. This volunteer-led walk will wander through north Richland looking at some of the more interesting examples of this international style. Approximately 3 miles. If you love non-stop action, randomness and just an exciting game, come and watch a match between Tri-Cities Fever vs. The Colorado Ice on Saturday, May 2 at 7:05 in the evening. The Tri-Cities Fever is the regions most exciting indoor arena football team that provides affordable entertainment in the form of hard hitting, action packed, in your face football. Have you caught the Fever? This coming Saturday, May 2 head to the The REACH for the "Spring Migration At the Reach – Birds are on the wing heading north" from 8:00 in the morning until 3:30 in the afternoon. As part of their 50th Anniversary year, the Lower Columbia Basin Audubon Society (LCBAS) is celebrating spring migration at The REACH. 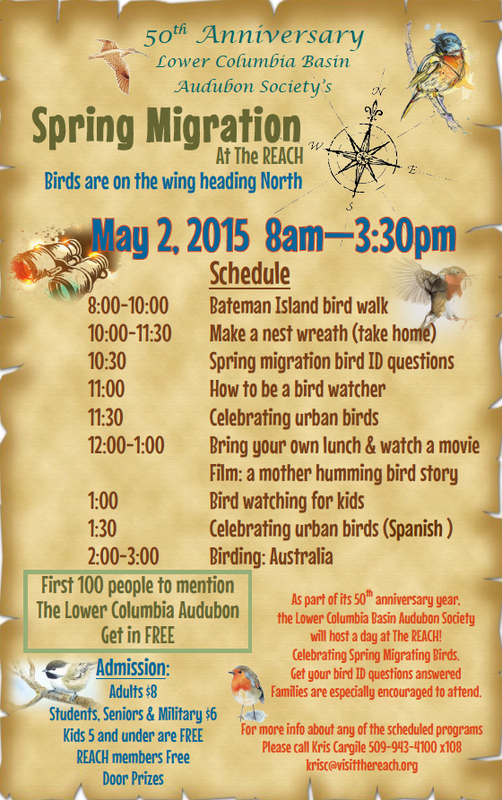 First 100 people to mention The Lower Columbia Audubon Society Get in FREE! Some binoculars are available to loan for the walk. Come to the Reach to learn about bird migration and have expert birders answer your questions. The REACH is located at 1943 Columbia Park Trail Richland, Washington. On Saturday, May 2 be entertained by R&B/ Soul performer Kenny Day at The Emerald of Siam located in 1314 Jadwin Richland, Washington. The show is free and will be from 5:00 until 8:00 in the evening. Kenny is a true renaissance man and a man of many talents. His major talent includes his vocals, his versatility, range and soulfulness that are truly world class. 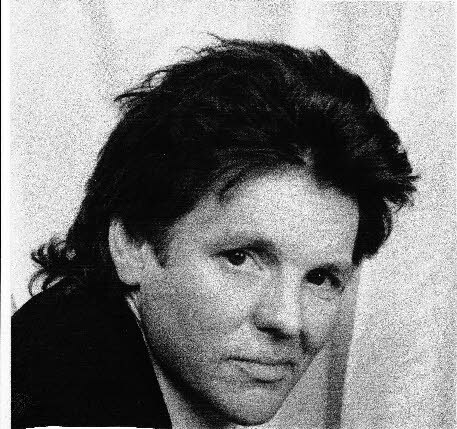 Kenny is also an accomplished songwriter with a number of songs published by Warner Brothers. He has been performing professionally since age fifteen, has written, sang, and played with the likes of: Randy Miesner (Eagles,), Ohio Players, Redbone, Average White Band, The Dazz Band etc. 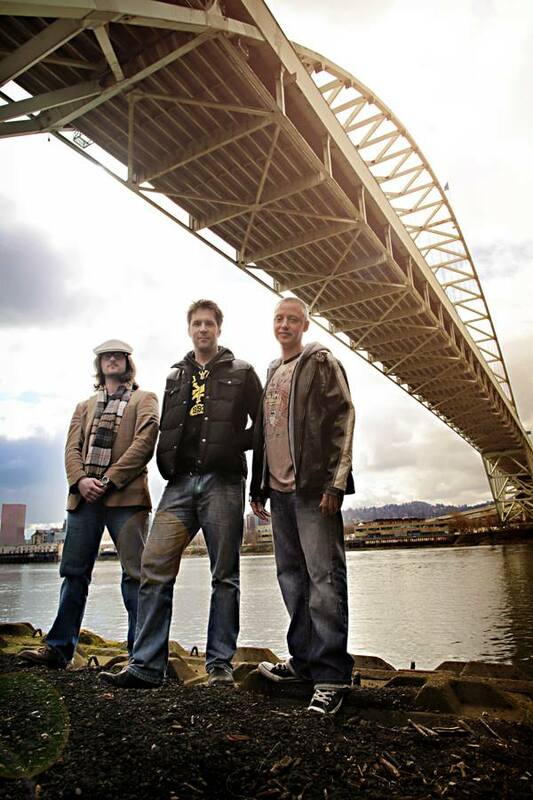 Funk Rock group from Portland, Dorado with Evan Egerer will be performing at The Emerald of Siam 1314 Jadwin Richland, Washington on Saturday, May 2 at 9:00 in the evening. Admission is free. Dorado combines musical sophistication with funky badass grooves and raw talent. I hear everything from Steely Dan to Beck to funk bands from the 70's like Tower of Power. Then take a smooth breathy vocal delivery and clever melodic choices to add over the top. It is really groovy stuff" - Portland engineer/musician and owner of 8 Ball studios Rob Stroup. 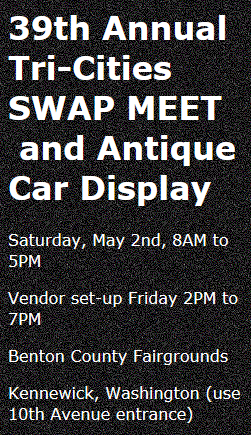 On Saturday, May 2 the 39th Annual Tri-Cities SWAP MEET & Antique Car Display is happening at Benton Franklin Fairgrounds in 1500 S. Oak Street Kennewick, Washington from 8:00 in the morning until 5:00 in the afternoon. Admission is free. The club was officially chartered in 1962 to preserve and maintain motor vehicles of historical value and to serve as an accurate and technical source of information concerning historical automobiles for the benefit of its members as well as the general public. 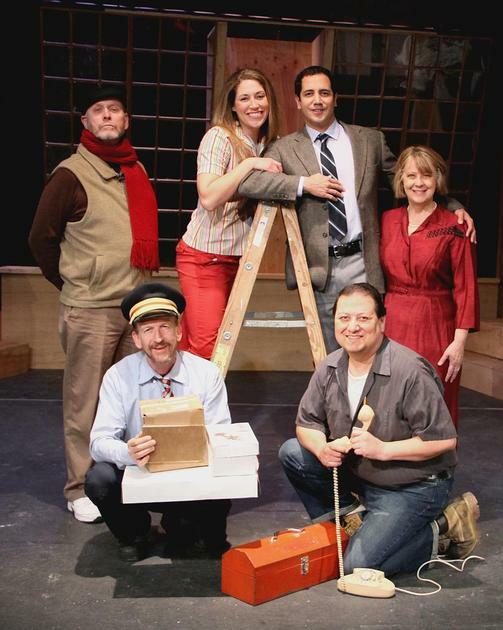 The Richland Players presents Barefoot In The Park from May 1 to 17 at the Richland Players Theater located in 608 The Parkway Richland, Washington at 8:00 in the evening. In this classic romantic comedy, newlyweds Paul and Corie Bratter are proof positive that opposites attract. He's a straight-as-an-arrow lawyer; she's a free spirit. But they quickly discover married life is no paradise, having to endure a new apartment that's falling to pieces, surprise visits from Corie's overly protective mother, and the antics of their eccentric neighbor in the attic, Velasco.